This pattern has really made the blog rounds, and it’s clear why. 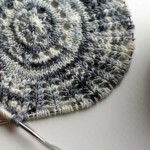 The repeat is easy to remember, you can make it any size you want, and the scallop-y edging is beautiful. 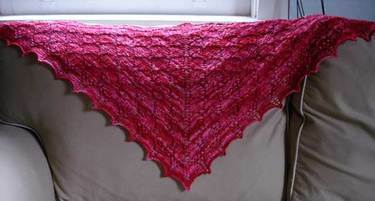 I don’t remember hearing much about the bindoff on the shawl, but it works really well. Those scallops need lots of stretch and the bindoff does just that. 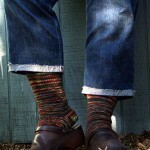 I may just try it on my next pair of socks, although I’m not sure how it would look against a rib. Yarn Twinkletoes Sock Yarn. This is not the world’s softest yarn. After the first soak the water turned a bright pink, but after rinse the second soak barely turned a color at all. I put in a healthy dose of deep conditioner and that seems to have helped. I’m not particularly sensitive so I don’t anticipate it bothering me. 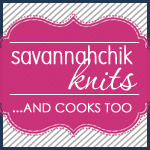 Plus, Deb contacted the dyer and she’s changing the yarn she’s using! This is really good news because she’s a great dyer! Measurements, etc. It’s 48 inches wide by 21 inches high in the center. I did 9 repeats (I think). I made it to wear under my coats so I didn’t want it any larger. And that was good, because I was ready to cast off by the time I did the last repeat! It’s beautiful and I love the way the yarn isn’t all one color! It’s gorgeous! Totally worth the wait to see the finished pictures, from one reader’s perspective. The color is yummy. Beautiful! The color is so pretty. 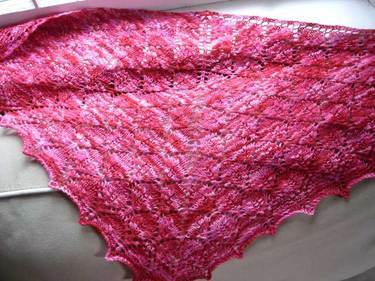 I admire your patience through all those repeats….the yarn makes me want to try lace knitting. Sigh. Beautiful blocking job, too. Lovely…I have to get back to mine one of these days. No MD for me this year but perhaps a Jersey or LI get together!! So pretty! This will forever be on my knit list. I have no idea when I’ll get around to it! Great job! And wonderful spring colours. That is a fabulous colour and absolutely beautiful, well done! That is gorgeous. Makes me think of cherry blossoms! Ooooh, it’s really a lovely color. I have the pattern too – I’m a big E Clark fan. I think you did an absolutely fantastic job w. it. Gorgeous!! I love that shade of pink. The color variations are just stunning. Wow, that’s really beautiful. Great work! Beautiful – I’ve always wanted to try that one – yours is gorgeous. Oh, wow – that’s gorgeous! Lovely! I have some of that yarn in my stash (from you — you’ve got me thinking . . .
That color is divine. It will really suit you. 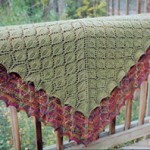 Very beautiful, I love the color and the shawl is gorgeous! Great job!